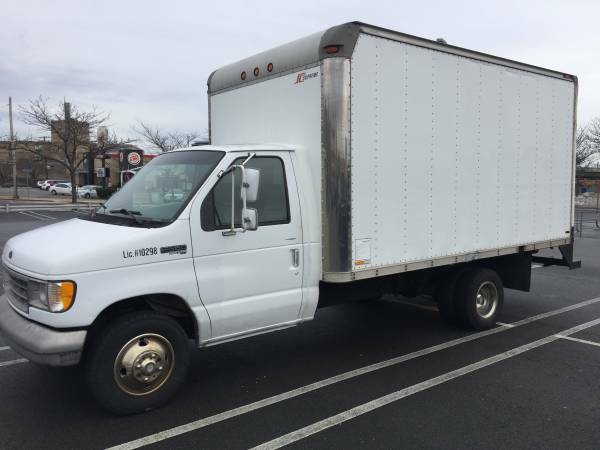 1996 Ford E350 condition: excellent fuel: diesel odometer: 40400 title status: clean transmission: automatic Can’t find a 7.3 powerstroke with miles this low. Why pay $40,000+ for a new truck when you can get a legendary powerplant and save a ton on insurance too. 14 foot Supreme skylight box with the typical dings. 8 feet wide 7.5’ interior height. It doesn’t love starting on super cold mornings. This truck recorded a 1.4 out of an allowable 20 opacity rating when checked for emissions. So it will pass smog in any state. Recent sticker. Everything works. The shifter stalk broke. It’s ugly with tape around it, but totally functional. The dings in the box are what they are and accurately photographed. The cab has a few typical small dings, no big dents. The driver’s seat is beginning to tear. Step bumper, no ramp or liftgate. This truck is ready to go for another 30 Years! I recently drove this 2500 miles in October through the mountains in NC and TN with a load and the truck had plenty of power and great fuel economy. The automatic transmission and overdrive hit every shift. I saw fuel economy as high as 16mpg loaded with household goods. The front brakes were just done, as well as a coat of undercoating. The rear brakes Probably have another 20,000 miles before they need changing. The inside of the box was recently painted. Tires are good, 75% tread. The van tracks straight down the road with no strange noises or vibrations. It does prefer to go 65 rather than 70+ on the highway. No cruise control. The rear springs and shackles are great as well as the crossmembers. Bumper has a nice step coated with herculiner to prevent slipping. Looks good too. The heat works, radio, ebrake, lights. The truck is turnkey. No lights on the dash Newer starter Recent Fuel Pump Oil change and chassis lube 2/3/18 Front brakes 10/17 Rear brake cleaning and adjustment 10/17 Driver’s side lower mirror is cracked, but fully functional. The doors have had the previous lettering painted over. I’m not a superstar with a can, so it does show from close up. I patched and painted a small area of the door sill. There are a couple small tears in the driver’s seat, pictured. Nothing crazy. This is a work truck. Please do expect the typical dings dents and scratches. It’s not a beauty contest winner, it’s a breadwinner. This truck is in great mechanical shape. I’m so confident in the condition of the van, If the buyer has any problems with the brakes, or powertrain within 30 days or 3000 miles, I will take it back! You can expect a private warranty contract for the utmost confidence. It is sold as is and there could be unknown mechanical defects, but I would drive this to California tomorrow without hesitation. The box has a pass through from the passenger compartment and would be great for any trade. Formerly owned by a plumbing company as an auxiliary vehicle and saw little use. Why buy a new van when you can buy a better truck for a third of the price? Don’t miss out. Low mile powerstroke box truck are so hard to find. This is a great vehicle and a great value. That’s ready for work. I need three seats or I would never sell it. I would consider owner-financing with a down payment of $5000. This van isn’t even broken in yet, has a million miles left before it’s ready to retire. The walls are bare, no shelving. Freshly painted floor. I reconditioned and painted the roll up door. If you want e-track on the walls, I have a few 5’ lengths I can put up. Happy to have this inspected by an independent mechanic. Whoever buys it will get a real money maker. Don’t miss out.